I think I spotted him just over that ridge! Rumor has it that there will be a sequel to Finding Nemo. And nobody is more excited than I am as I only watch movies about lost fish and those who have lost them, and I'm getting pretty sick of re-watching Finding Nemo and Splash 3: The Remorse of Walter Kornbluth (I mean, how many times can Eugene Levy fall off the dock and into the water wearing that ill-fitting wetsuit??? Honestly!) Truth be told, I've been trying to get a sequel made for years. I even wrote a screenplay in case those Hollywood bozos needed one. Here it is! 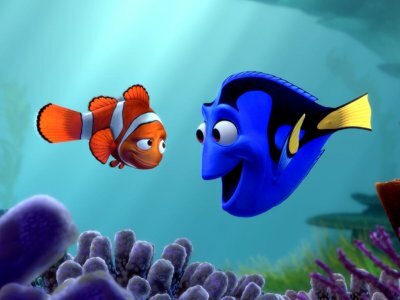 Marlin: Don't ever disappear again! Nemo: I won't, Dad. Thanks for finding me! Before you say anything, know that I realize it needs to be fleshed out a lot. This is just a rough draft that I put together quickly so that I could say I wrote a whole screenplay and impress people. But it clearly has a beginning, a middle, and an end. I mean, what's the plot? It's right there in the title. Does it have excitement? Definitely. Marlin has found Nemo. That's pretty exciting, considering he was lost the whole last movie. Will Nemo disappear again? No, because the last line right there reassures us that he won't. No further search for Nemo is necessary. Resolution. After that they can do Finding Nemo 3: He's Right There but Marlin's Eyes Are Totally Closed, Finding Nemo 4: Off the Hook (Starring Eugene Levy. He already has the wet suit. ), and Finding Nemo Disrespectful: The Teenage Years. Then, I can move on to carrying out my ultimate goal, which is making a feature length film based on that episode of The Cosby Show where they have a funeral for Rudy's goldfish.